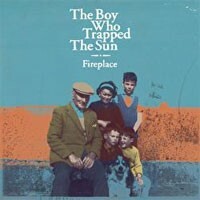 The Boy Who Trapped The Sun is 25 year-old Colin MacLeod - the 'Boy Who' moniker, he says, 'feels bigger and less lonely'. Originally from the Isle of Lewis, a windswept outcrop of the Outer Hebrides, MacLeod was discovered swinging round the rafters of an Aberdeen bar, dishing out Deep Purple covers and, he says, 'generally acting like an arse'. Having smashed his guitar and knocked himself unconscious on stage, he set to cleaning up both the broken instrument and his act. Thus The Boy moved to London, to become a solo artist and an adult. And so emerged "Fireplace", with MacLeod playing all the instruments bar the strings himself. Hazy opener "Golden" sets the scene, with MacLeod gently drawing the listener into his world. New single "Katy" is more upbeat, a catchy paean to avoiding commitment. Title track "Fireplace" was written when MacLeod was housebound for four days as a fierce storm battered Lewis, while the loose, bluesy "Home" was written in London, about being displaced in the big city - 'This city's not a home, but it's somewhere to get lost'. "Walking In The Dark" is an achingly pretty piano-led track, while the waltz-y, wry "Dreaming Like A Fool" is the tale of ex-girlfriend who tried to stab MacLeod. 'Lately it feels like we're drifting apart', he sings. 'It could be because you're insane'. Riding on a dream-like descending riff "Copper Down" features exquisite harmonies and a deft, mid-song change of pace. The final track is the haunting, beautifully arranged "Antique Cobweb". There follows the hidden spoken-word outro "Poem", its second verse in Gaelic, wonderfully evocative of the Isle of Lewis and the sea that defines it. "Fireplace" is a beautifully realised debut from an authentic new talent. Listen again and again.